Beginning next month, the city of L.A. will allow supergraphic signs advertising a Warner Bros. kid’s movie to be displayed on fences, shelters, and other structures in three city parks. 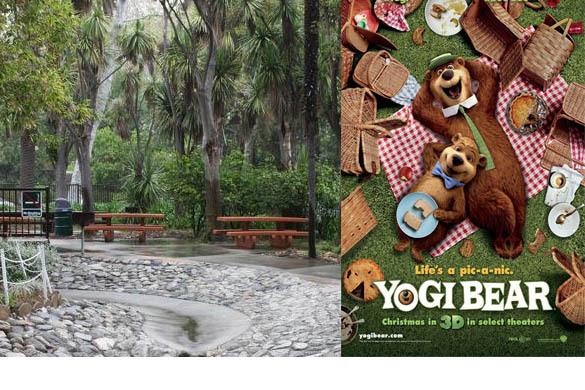 Ads for the upcoming 3-D movie, “Yogi Bear” will also be displayed on trash receptacles, light standards, and picnic tables. According to terms of a deal approved last week by the Board of Recreation and Parks Commissioners, the city will receive $42,636 from the advertising to run through the month of November in Holmby Park in Westwood, Pan Pacific Recreation Center in Hollywood, and the Sepulveda Basin Recreation Area in the San Fernando Valley. The advertising deal with Warner Bros. was made by the non-profit Los Angeles Parks Foundation, which will receive $57,000 from the movie company. The foundation will then deduct installation costs and an administrative fee before turning over the remainder to the city’s department of recreation and parks. Photos included with the report show depictions of the Yogi Bear character on vinyl supergraphics stretched across the face of a park building, on the roof of a picnic shelter, and along the fence of a playground. To read report, click here. Although the parks foundation is not a city agency, the chairman of its board, Barry Sanders, is also the president of the Board of Recreation and Parks Commissioners. A foundation board member, Jill Werner, also serves on the city board of commissioners. In L.A., both off-site and supergraphic advertising signs are banned with certain exceptions, and the legality of the supergraphic ads in the parks was raised in last week’s board meeting. According to a spokesperson for Councilman Tom LaBonge, who chairs the council committee that oversees city parks, the City Attorney’s office is expected to render an opinion on that question. A repeated argument by sign companies challenging the city ban in court has been that allowing advertising on public property is discriminatory and unconstitutional, because only certain companies are allowed access to the public space where advertising is allowed. The companies have also argued that allowing this advertising undermines the stated purpose of the general ban, which is to promote aesthetics and traffic safety.